I have been submitting Karl Marx and Careful Driving in 2,000-word chunks for the delectation of my fellow scribes of the Severn Valley Authors. When we convened at The Arches pub on 18 May I read out an extract that resumed the description of the drive across Poland and applied Plato's conflict of the World of Ideas and the World of the Senses to the controversial matter of speeding and the more straightforward arena of vehicle design. 'I found Chris's piece a brilliant melding of high ideas with everyday detail. It seems to me that Chris is close to perfecting his experiment in blending a history of philosophy with a compelling road trip,' Tony reported on the SVA's blog (http://severnvalleyauthors.blogspot.com/). Time is a jet plane, it moves too fast, sang Bob Dylan. The awareness of mortality gives human beings a unique perception of the value of time. For an alternative perspective on the nature of time Dylan might like to spend a few hours waiting here at Frankfurt-an-der-Oder, or at Kukuryi, Waidhaus, Nadlac, or any of the previously insignificant border hamlets that have swiftly attained notoriety among drivers for the infamous bottlenecks with which they have become associated. Time passes with excruciating slowness. Frustration mounts and tempers become frayed. In March I waited twenty-nine hours to enter Romania at Nadlac, and while waiting to enter Poland at Guben last month I heard rumours of queues over twenty miles long and rioting at Frankfurt-an-der-Oder. According to Thierry a Polish customs officer had been fatally stabbed by a Russian driver. 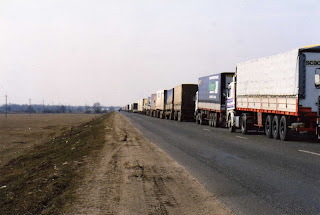 I drive into Poland at 2.15 a.m. on a fresh tachograph chart having reasoned that ten hours of sleepless queuing on the Oder-Neisse Line is so far beyond the bounds of normality as to justify the temporary suspension of the European Union's Drivers' Hours Regulations. Plato's observation that the material world was in a state of constant change preceded Hegel's by over two thousand years. It led him to the belief that the senses through which people experienced their environment were an unreliable sourceof truth because the truth was eternal. Everything in the World of the Senses was an imperfect ephemeral version of a perfect and eternal conceept or blueprint that resided in the World of Ideas. In the World of the Senses living matter grew, withered and eventually reverted to dust, and inanimate objects were transformed over time by sunshine, wind, rain and tides. Absolute, immutable and eternal truths that were unaffected by relativity, time or place inhabited a separate World of Ideas that could be reached by the power of the intellect but were beyond the scope of sight, sound, smell, taste or touch. Specific examples of beauty present in the material world were transient shadowns of the eternal, perfect concept of beauty. Eternal features shared by specific trees, sunsets or people resident in the World of the Senses were combined in a perfect, immortal concept tree, sunset or person exclusive to the World of Ideas. Only the philosopher who had made the intellecutal journey from the World of the Sense to the World of Ideas could claim to possess knowledge; everyone else had to make do with opinions. Absolute, immutable and eternal truths are confined to the hypothetical realms of mathematics, ideology, religion and the minds of the zealots who draw up the regulations by which we are expected to live. The square on the hypoteneuse of a right-angled triangle equals the sum of the squares on the other two sides. Hypothetical straight lines and perfect triangles are replicated imperfectly in the real world in Give-Way signs and slices of quiche. In place of the old bourgeois society, with its classes and class antagonisms, we shall have an association, in which the free development of each is the condition for the free development of all. Marxism was a perfect and eternal hypothesis that failed to make the transition to the imperfect and evolving human becoming. God separated the light from the darkness and he named the light 'Day' and the darkness 'Night'. Evening passed and morning came - that was the first day. After creating the universe in six days God took a weekly rest period. We are the flawed replicas of a perfect blueprint that resides in a hypothetical world of the eternal and the absolute. Thou shalt take a minimum daily rest period of 11 consecutive hours. This may be reduced to 9 consecutive hours on 3 days a week but thou shalt compensate for any such reduction by an equivalent period of rest being added to a daily or weekly rest period before the end of the following week. 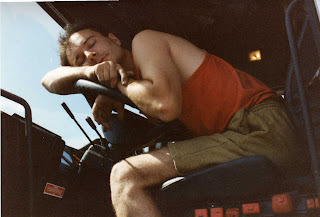 Devised by people who have never driven a truck and whose working day begins at 9 and ends at 5, the Drivers' Hours Regulations are composed of straight lines and right angles, designed for the European Union's perfect and eternal concept-being. Because I'm a flawed replica entirely devoid of straight lines and right angles, my safety depends upon whether I happen to feel tired rather than whether I have taken the statutory minimum daily rest period. Like ideology and religion, legislation has to be applicable to the shifting realities of the sensory world if it is to be effective. 'We have to be practical about these things,' Henk is wont to remark, but whether the police or the ministry share the boss's definition of 'practicality' is open to debate. Now that I'm no longer in the European Union I doubt that the regulations apply anyway. Experience of the sensory world tells me that a three-hour drive from the border should see me to the secure parking are of the motel outside Wrzesnia, where a three-hour kip under the duvet on the Volvo's bottom bunk ought to recharge my batteries whilst still allowing me sufficient time to reach the motel at Siedlce within the maximum permitted fifteen-hour shift. Driving based on observation, experience and common sense will inevitably bring those motorists condemned to the impermanent World of the Senses into conflict with legislation that requries instinctive obedience to permanent, eternal speed limits from the hypothetical World of Ideas. The fourth item on my list of targets for 2010 was to have at least fifty talks booked for 2011. This seems to be more realistic, although I didn't think so at the time. I have already done 15 this year, with another 14 more booked. Late bookings are bound to increase the amount for 2010. I already have 12 booked for 2011 and intend to send out more mailshots. The purpose behind the talks is principally to promote 'Why Don't You Fly?' The Amazon ranking for 'WDYF?' on Wednesday 16 June 2010 was 7,416. Today, on 29 June, it is a depressing 107,176. The ranking fluctuates wildly - sometimes from six figures to four figures and back again within a fortnight. Usually the figure remains somewhere between 10,000 and 99,999 but today 'WDYF?' is currently the 107,176th most frequently bought book from Amazon. It sounds terrible but several books by higher profile authors with big publishers have a much lower rating. Some even have ratings of seven figures - which indicates just how much competition there is, and more books are being churned out all the time - good, bad and indifferent. My spirits rise and fall in an inverse relationship with the rising and falling ratings, but after five years on Amazon 'WDYF? 's rating hasn't shown any sign of permanent decline. Sales are steady, if unspectacular. I can't help speculating about the reason for any sudden surge up the rankings. It might have been through word of mouth following sales of the book at one of my slideshows or the result of visits to the website, or even a belated review by a magazine. Or was it because one or more people saw the advert on the rear windscreen of the car? Surely, I think to myself, the driver stuck behind me in this traffic jam or following me on the road home after one of my talks would make a mental note of the website and investigate? After all, this is a little different from the usual advertisement for a small business one sees on cars or vans. But people lead busy lives and many don't have time to read books any more. And I'm making the mistake, of course, in taking it for granted that the driver behind me would have similar interests in foreign lands and physical and mental challenges. 'Chris, just loved your book. 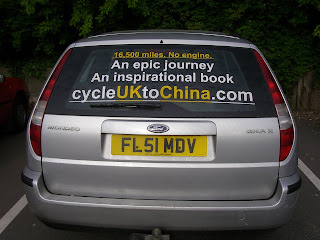 I was once Beijing correspondent for the BBC (mid-80s) and you might even have read an FOOC or two of mine in that book to which you took recourse in Lanzhou waiting for the tyres. After what for me was a bit of a slow start, I so got into your book that I could scarcely put it down. Your writing, in many parts, is quite beautiful, as well as hilarious, and how you describe the encounter with Gao will stay with me for a long time. Also, my wife Sue is a budding writer and she found your thoughts on Being a Writer inspiring, and sobering. I read her chunks of your book and your website as we were canal boating around the Four Counties last week. It was meeting a Brit cyclist atop the Khunjerab in 1986 (I so recognised what you described, although we did it in 4x4s from Kashgar to Islamabad) that inspired me, eventually, to tackle long-distance biking myself. I went to Budapest and back last year on a Thorn Raven (Rohloff, coupled) and am planning next year, to mark my 60th, to cycle to Moscow (another old posting), and after the Trans-Siberian, from Beijing to Hanoi, before carrying on around Oz, NZ and the US with my wife on our (also Thorn, coupled) tandem. In short, it might be fun to meet up, if you were game. (I loved your description of Varkala too, which Sue and I visited last year and loved.) We live in Cirencester and I'm intending to set off at Easter next year. Some trepidation but also excitement. And I look forward to reading your new book. Mark drove to Bewdley for Sunday lunch last month, having postponed his round-the-world trip until next year. In what was a combined effort, Linda cooked a prawn curry while I occupied myself with the Saag side dish, the pilau rice and the poppadums. It was fascinating to hear Mark talk about his postings in Moscow and Beijing (where he covered the events at Tiananmen square in 1989). His fluency in five languages, including Russian and Hungarian, was instrumental in his appointment as a foreign correspondent, firstly for Reuters, and then for the BBC. He has changed career and is now working as a psychotherapist and is particularly interested in the psychology of Karl Jung. Among his other interests are cycling, navigating the UK's canal network on narrowboats, and ecology. He has fitted solar panels to his house in Cirencester and I'm looking forward next year to hearing about the epic bike ride. Readers like Mark Brayne have indicated that 'Why Don't You Fly?' is probably a better-than-average and possibly even a very good travel book, but it isn't sufficient for your book to be better-than-average, or even excellent, if you are an unpublished or a self-published author. Rob (http://robertronsson.co.uk/) is currently undergoing the horror of submitting his latest manuscript to the 'closed shop' ruled by the literary agents and publishers. As fellow members of Severn Valley Authors we offered to read it through for him and offer any thoughts on how it might possibly be improved, so for the past couple of weeks I've swapped my customary bedtime research of politics, philosophy or history for 'The Spaniard's Wife', a fact-based-fiction tale of infidelity, socialist politics and industrial unrest set in the Glasgow of the early 1900s. It is (so far) proving to be an interesting and original idea, throroughly researched and expertly recounted by a writer with genuine ability. Rob is nevertheless confronting the problem experienced by all unpublished authors: if you have neither celebrity nor the right background or contacts, you may as well resign yourself to self-publishing - unless of course your work is judged by an editor to have strong potential to make an immediate and strong impact upon the market. It is that hope that keeps us submitting our manuscripts. For all the dissmissiveness and condescension of their rejection slips, agents and publishers depend upon the author's hope or belief; even John Grisham, Fay Weldon and J.K. Rowling started out by submitting manuscripts as unpublished authors. They hoped. They believed. They persisted. They succeeded.